GuitarFreaks V7 & DrumMania V7 machine set - Hot Price! GuitarFreaks V7 & DrumMania V7 machine set is now available at a very special price. Set includes GuitarFreaks V7 and DrumMania V7 machines, which are able to be linked together for multiplayer action. This version of Konami's popular guitar/drum music game series includes over 40 new songs. GuitarFreaks V7 & DrumMania V7 are currently the latest games in the series, released mid 2010. GuitarFreaks V7 & DrumMania V7 machine set is in good Used condition, 110v, and located in Japan. The price for both is $6,950 usd (until sold out). 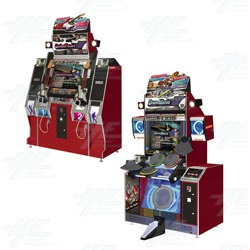 We also have GuitarFreaks V6 & DrumMania V6 machine sets available for sale. Set includes GuitarFreaks V6 and DrumMania V6 machines, which are able to be linked together. This version includes over 500 songs comprising a wide range of genres including rock and pop. GuitarFreaks V6 & DrumMania V6 machine set is in good Used condition, 110v, and located in Japan. The price for both is $4,500 usd (until sold out).